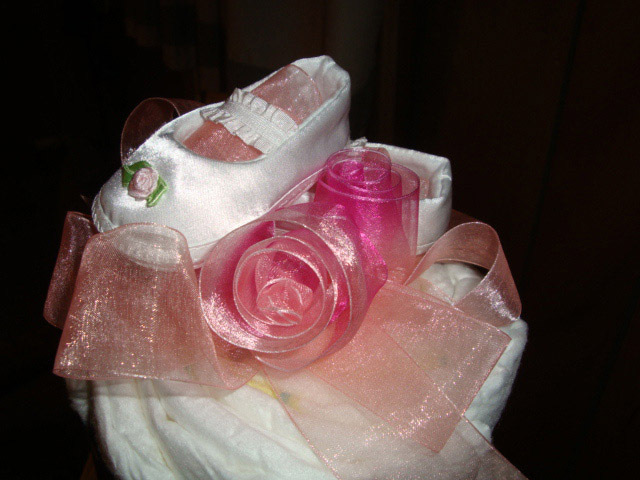 This Rose Diaper Cake is downright precious. Every time I look at the delicate ribbon-rose on top, I find myself staring at it because it is just beautiful. What a perfect way to welcome a delicate baby into the world! The initial on the front of the cake is a wonderful idea as well. Jennifer from Tallahassee shared her wonderful Rose diaper cake with us, and she also shared some instructional photos of how she made the cake, which are a huge help to all of us! I am constantly impressed by the level of help that our readers give to others by sharing their ideas, creativity and photos on this website. We have the best group of readers right here, inspiring one another. Thanks for sharing Jennifer! Your cake is beautiful! 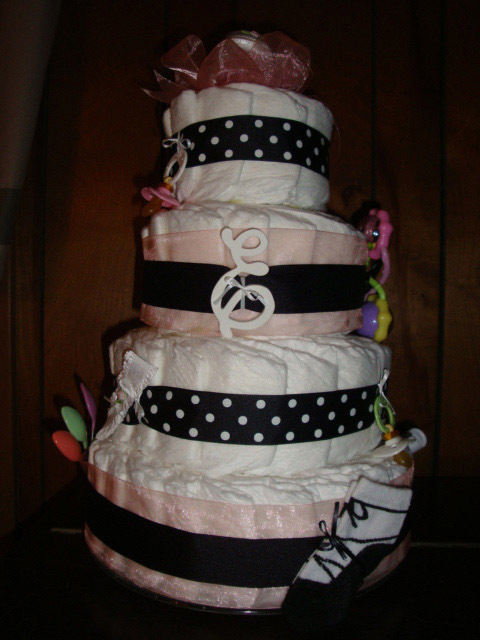 This was my first attempt at a diaper cake. I was pleased with the result and I hope this will be helpful for you to make your own (this site helped me get started). Diapers size 1 & 2: bottom: 25, next: 17, next: 13, top: 9. Layer on top of each other going around until they meet up.Ribbon: 1/8" white (10 yrds on spool) to tie around layered diapers (I tied it loosely around layered diapers when they became hard to layer, then when it was completely around, I tightened the ribbon). 1/8" black to tie on baby items. 1 1/2" black/black & white polka-dots (9 feet on each spool). 1 1/2" sheer apricot (9 feet) attached to solid black ribbon with Glue Dots; also looped around itself to make a bow for the top and used wire to gather the middle of ribbon. 1 1/2" apricot/pink wire ribbon to twist into roses (pull wire on one side to gather ribbon then wrap around itself until it looks like a rose. You can use the extra wire that is sticking out to "sew" the ribbon together and then twist wire to anchor). Various baby items (the "E" was a clearance,wood letter at Micheals). 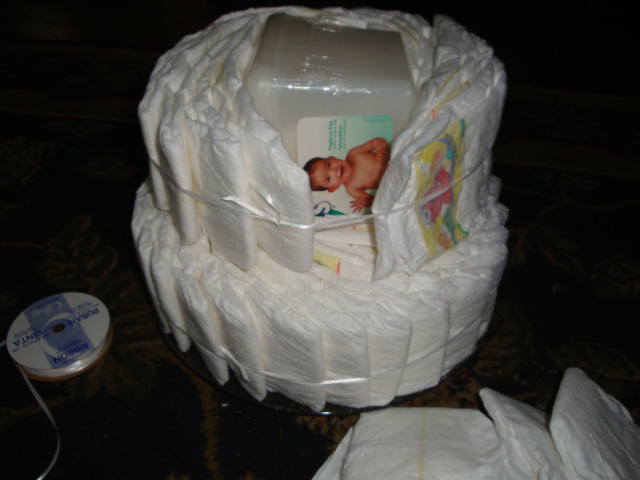 After layering and tying each level of diapers around the wipes/wash, I wrapped the thick ribbon around them and glued the ribbon together with craft glue, then paper clipped it until dry. No glue was used on the diapers so they are ready use when mommy needs them. The mommy-to-be loved the diaper cake and is trying to convince me to go into business. A few woman at the shower asked where they could order one : ) It was practical, beautiful and fun! Jennifer, it's easy to see why the expectant mother loved it! So pretty!! 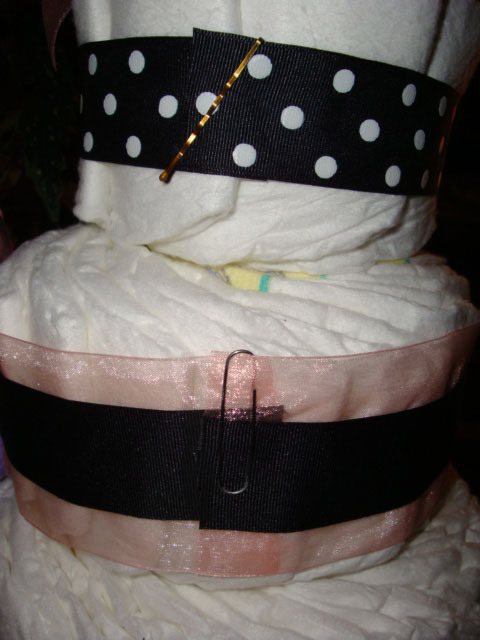 Making your own diaper cake? 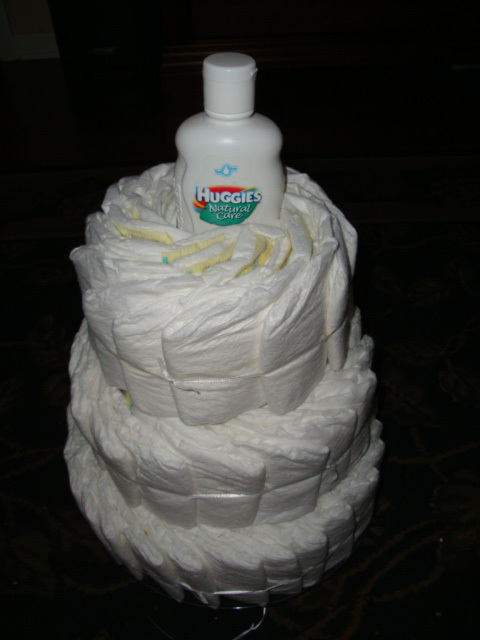 Follow these simple diaper cake instructions to make your own diaper cake. It is an easy, step-by-step method. You can do it!